QUITO, Ecuador, Dec 8 2016 (IPS) - No one is really prepared for an emergency until they’ve had to live through one. And the 16 April earthquake in Ecuador put us to the test. With the drawdown in the humanitarian response phase that is providing relief to survivors and victims, the hustle and bustle is dying down. 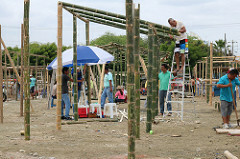 Remnants of the disaster can be seen everywhere, and an idea of what the near future will bring and people’s resilience – their capacity to cope – is taking shape. During tours of the affected areas, I saw that people have, to a greater or lesser extent, a natural conviction that pushes them to overcome the situation they are in. Shortly after a catastrophe hits, whether from the need to survive or from attempts to recover the normality that has been ripped from them, men and women begin to help each other out. They get together and cook, and they care for, console and support each other. In places such as Pedernales, one of the hardest hit areas, just days following the tragedy, people had set up cooking hearths and places to prepare food to sell outside destroyed businesses. They organized games of ecuavoley (Ecuadorian-style volleyball) in streets where rubble was still being cleared. The institutional structure is another element that affects how fast communities recover. Having a response system, with mechanisms to quickly and strategically identify needs, makes recovery efforts more effective. Communities are more vulnerable if local authorities are absent and exercise less authority to ensure, among other things, compliance with building and land-use standards. Nationally, strong institutions and clarity in carrying out specific roles have enabled timely and appropriate disaster relief to affected communities. This undoubtedly will influence how quickly the country will recover the human development gains and how well it will design mechanisms to alleviate poverty caused by the earthquake. This is evident even now, seven months after the earthquake. Coordination to identify needs and rebuild is vital in the reconstruction process. The event has been a wake-up call about the importance of supporting and strengthening local governments in their role as land-use planners and construction-quality inspectors. Poor people who have been hit by an earthquake live on the edge, where one thing or another can lead them to either give up or to survive. Therefore, it is crucial for actions to be fast, but also well thought-out. Resilience is something that permeates survivors and is passed down to future generations. 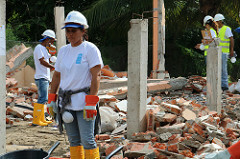 Building resilience should be one of our main objectives and responsibilities as institutions in a country such as Ecuador, where we live with the constant threat of natural disasters.